I wanted to throw a party for Lilah after Chloe was born so that she would feel special. Going from being an only child to a big sister overnight is a huge adjustment. 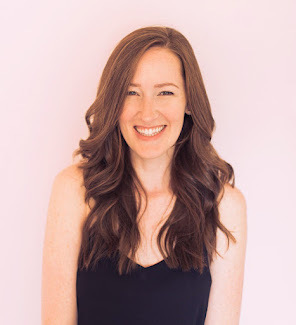 I decided to do the party just a few days after we got home from the hospital when we were really in the trenches so I wanted to keep it really simple. I used what I had on hand but all you need is plates, napkins, utensils, cups, balloons, and cake. That’s it! She was SO thrilled to have a party all about her and it took me no more than 10 minutes to set up. Here's how I did it. Activities: We read a big sister book, drank “tea”, she had a dance with daddy, and played with balloons. The balloons on the floor doubled as an activity and decor. Weeks later, she’s still finding them randomly around the house and playing with them sporadically, definitely a win. Food: Ice cream cookie cake like we had at this party is her current favorite. So although that's not what you see in the photo, that's what we ate ;-) We had our party right after lunch so all we ate was the cake. If she liked pizza I would have ordered that too! 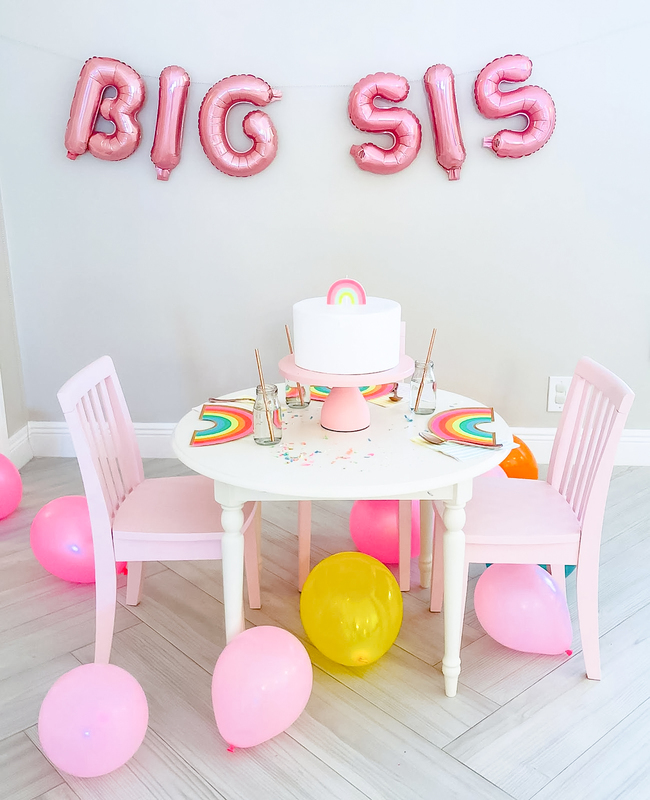 Decor: So they don’t really sell “Big Sister” party themed decorations anywhere that I've seen. So I suggest just picking a color scheme and adding letter balloons that spell out Big Sister or Big Brother. 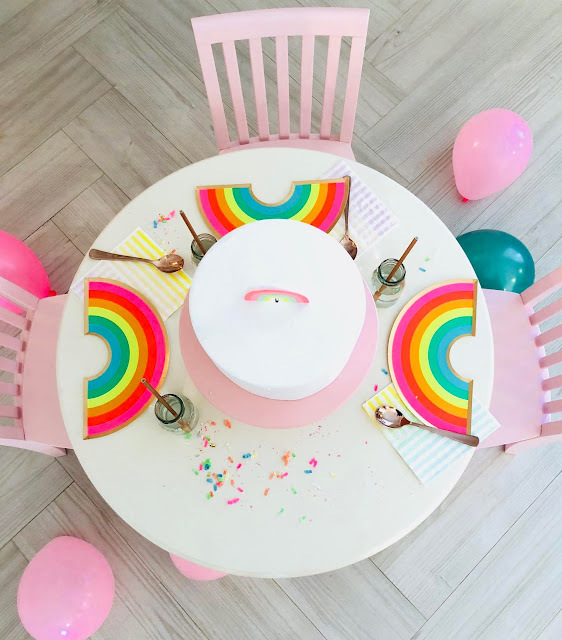 I chose a rainbow theme because I had some rainbow plates on hand that I knew she would love. A solid color would have worked just as well. Add in some balloons on the floor and maybe some confetti on the table and that's really all you need. Guests: We were the only guests, just the 4 of us, while the baby napped in the swing. I considered inviting some of her friends but it ended up being so much easier and SO special with just us that I was so happy it turned out that way. What to Wear: When she met her sister for the first time in the hospital, she wore this Big Sister Dress from Etsy so I was happy to be able to use it again and so was she. These dresses from Amazon are cute options too if you need faster shipping. 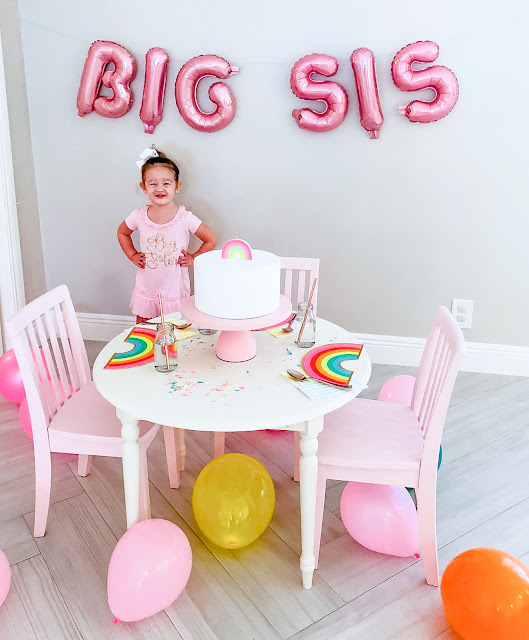 This big sister party ended up being so more special than I expected it to be. She was just so happy and seeing her little face light up the way it did is something I won't ever forget. I never expected a small thrown together party would make her so happy. Nothing is more exhausting than those first few days home with a new baby but this little party was more than worth the effort.